First whisky from the mothballed Imperial distillery so far on the mission ... and the people rejoiced ... hooray!!! This is just one of the 21 distilleries built in Speyside during the whisky boom of the 1890s (b.1897), it is one of four mothballed distilleries in owner Pernod Ricard's stable (we'll have the product of another later this week), and it was the first to be commissioned for sale (subsequently cancelled) to a real estate agency. Although located right on the Speyside Way (by Carron), Imperial never had a visitor's centre partly because it was in operation for just 7 years between 1985 and 1998. 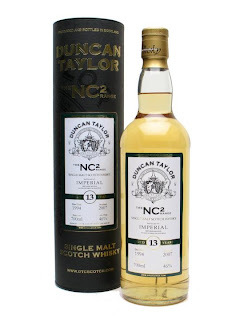 The NC2 range from independent bottler Duncan Taylor and Co. are single cask bottlings that are Not Chill-filtered and Not coloured (hence N.C. x 2). In the first edition of his Malt Whisky Companion, Michael Jackson described this whisky as "perfect for bedtime." Let's see if it's perfect for breakfast. Incredibly fruity, estery with a creamy bourbon core. Candied, but not too sweet. Ginger. Pineapple. Warm, sweaty pencil after an exam. Sweeter than the nose with a charred oakiness that keeps it in control. Creamy and toasted with caramel, a bit of tobacco, and a nice long oaky finish. Oat cakes. OaK cakes. Really nice drop that has absorbed lots of oak character in just 13 years. Creamy and fruity without being too sweet. Friendly price, too. Always happy/sad to find a good expression from a mothballed distillery, isn't it? "Warm, sweaty pencil after an exam?" Well, it's a strangely vivid description! Not sure if that makes we want to drink, but it's vivid. You really do study poetry, don't you?